In the second episode of the first season of True Detective, entitled “Seeing Things,” the characters Rust Cohle and Marty Hart are investigating the murder of Dora Lange in the year 1995. Their investigation leads them to a burnt-out, crumbling church in the middle of a desolate Louisiana swampland. Upon exiting the car, Rust Cohle (played by Matthew McConaughey) looks to his side and sees a flock of birds rise from the ground. The birds soon begin to synchronize their movement, forming a sign or symbol in the air. For a moment, Rust looks puzzled — or as if he has experienced deja vu. Then, without a word, he moves on, and the detectives continue toward the burnt-out church. Three years ago, while I was watching that specific scene in that specific episode, it immediately reminded me of something, but I couldn’t place what it was. Watching the scene play out, the setting itself gave the scene a sense of foreboding, while the random hallucination added a thrilling sense of mystery and the fantastic. It reminded me of books I had read as a child — young adult horror books. Ones with remarkable covers that had frightened and enchanted me as a boy. But the names escaped me. I finally found relief after a series of Google searches (as one does). The books that one brief scene in True Detective had dredged from my memory were by a young adult author named John Bellairs. And the cover art that stood so vividly in my mind, pen and ink drawings full of shadowy forms and eerie faces, were by the artist and illustrator Edward Gorey. In his lifetime, from 1938 to 1991, John Bellairs authored 15 young adult horror books. His work is distinguished by three different “series” that focused on a particular teenage boy protagonist: Lewis Barnevalt, Anthony Monday, and Johnny Dixon. In each series of books, the protagonist becomes wrapped in a mystery that involves fighting some force of evil: deceased knights, maniacal wizards, or British occultists bent on destroying the world. 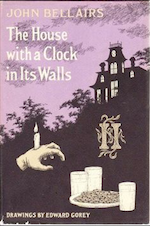 John Bellairs’s most famous young adult novel was his 1973 debut, The House with a Clock in Its Walls. But the Bellairs books I knew best as a child were those in the Johnny Dixon series. In them, Johnny, who lives with his grandparents in 1950s Duston Heights, Mass., because “his mother was dead and his father was flying a jet in the Air Force” (an actual description from The Secret of the Underground Room) finds himself involved in frightening adventures with his friend Professor Roderick Childermass. Professor Childermass is an active professor in his 70s who is cranky, smokes Balkan Sobranie cigarettes (one of the oldest brands of luxury tobacco in the world), an expert on the occult, and loves to bake cakes (with fondant icing) and other complicated desserts with Johnny. What gives the Johnny Dixon books much of their appeal is the frank way in which matters of the occult are treated by the characters. Professor Childermass is known to say things to Johnny like, “You were right when you said the ghosts of the living sometimes appear to people,” without further explanation. Leaving aside how profound a line like that is when closely analyzed (it is truly something Joyce might have included in the Scylla and Charybdis episode of Ulysses), the forthright and simplistic acceptance of elements of the fantastic is charming, even to an adult reader. There’s no messing around in theories or justification. The logic is simple: some things are just true and they are also just scary. 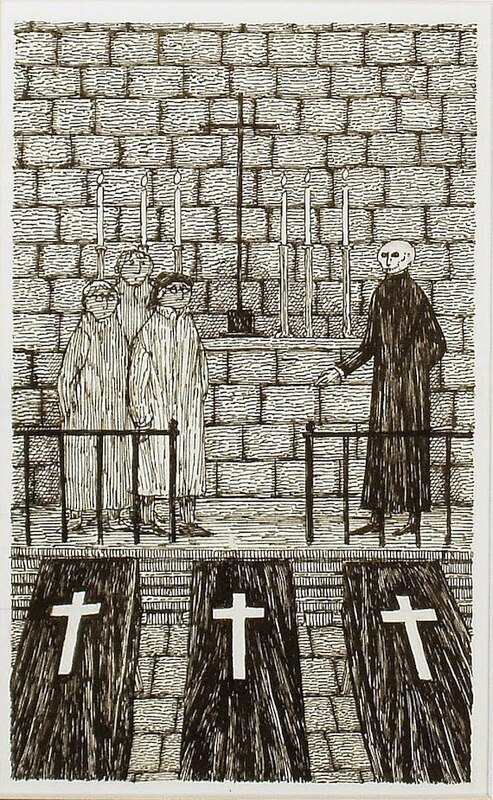 Now, this all might sound like well-trod territory in a post-Harry Potter world, but what set the Bellairs books apart, and perhaps ingrained them so deeply in my memory, were Edward Gorey’s cover illustrations. Before his death in 2000, Gorey had a long and fascinating career as an artist, one that took him from the Art Institute of Chicago, to the Poet’s Theatre at Harvard (working alongside Frank O’Hara, John Ashbery, and others), to a position at Doubleday in the art department, to printmaking and producing experimental theatre in Cape Cod during the latter part of his life. Gorey’s greatest career success is perhaps his costume design on the 1977 Broadway revival of Dracula, which won him two Tony Awards. However, what he may very well be best known for are his covers for John Bellairs’s novels. Gorey’s corresponding illustration in the book’s frontispiece shows a man dressed in a long, black robe, with a skull for a head. Behind him, six thin, white, candles are lit, their bases shaded with heavy ink lines. The man faces Johnny, the Professor, and Fergie, each one with a uniform, non-plussed, almost childish look on their faces. Below them sit three identical coffins penned fully in black. However, despite their interwoven legacy in the minds of readers, Bellairs and Gorey never met. A member of The Edward Gorey House Museum in Yarmouth, Mass., went so far as to say that they may never have corresponded. At 84, Brown has spent a large portion of his time immersed in the life and work of Edward Gorey. They met at the legendary Gotham Book Mart in New York, which Brown bought from Frances Steloff in 1967. After helping Gorey set up his trust, Brown served as something of a financial guardian angel for the artist. And the picture Brown paints of the relationship between Gorey’s illustrations for John Bellairs’s novels is one merely of a professional obligation. The relationship between authors of children’s books and their illustrators is traditionally more of a professional arrangement than close collaboration. Usually, a publisher will keep the author and illustrator as separate as possible in the publication process so as not to throw any complications into production. However, there have been iconic author and illustrator pairings that have broken this unwritten rule, such as Roald Dahl and Quentin Blake and A.A. Milne and E.H. Shepard (who illustrated the Winnie-the-Pooh books) among others. And Gorey’s disconnect from those beloved illustrations would most certainly come as a shock to readers who still cherish John Bellairs novels. “There are not as many anymore,” Leanna Campbell told me based on her experiences at the Swanton Public Library. “But they’re still out there, especially fans of Gorey’s work.” Indeed, they are still out there, especially on Twitter, where readers still show their appreciation of Bellairs’s with snapshots of pages from the book featuring their (or their kids’) favorite quotes. Or, more likely, they are sharing their favorite Gorey cover. Like those young guys from Wall Street, I had read John Bellairs books in elementary school. But the names John Bellairs and Edward Gorey had receded into my own memory until a single scene in True Detective pulled them back. It would be tenuous at best to say that a prestige television show — one full of more grotesque horror than any Bellairs book or Gorey illustration — about a fraught partnership reflects in any way on the relationship between the two men. So, I won’t try to draw any conclusions there. 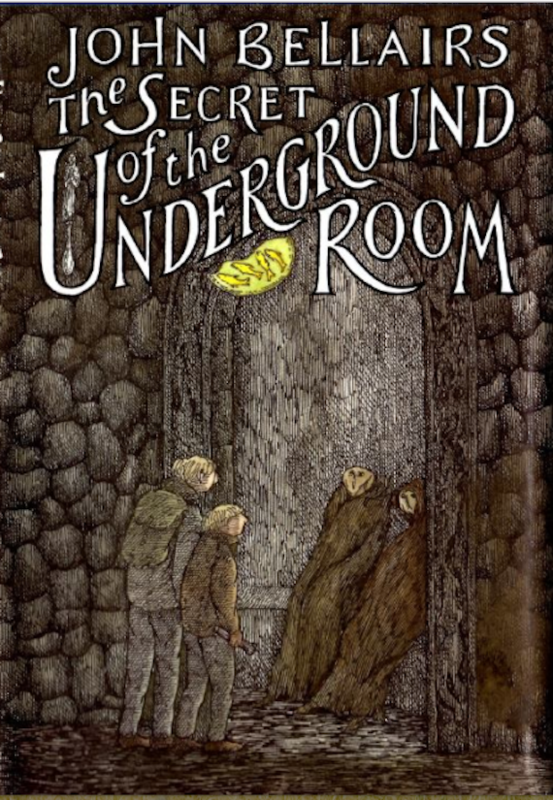 Instead, after re-reading several of the Johnny Dixon books, which I ordered online in a rush of excitement to research this story, the only conclusion I can come to is that John Bellairs’s stories and Edward Gorey’s illustrations still make a perfect match. The moments of horror in Bellairs’s fiction are abrupt and unsettling: a glance towards a window reveals a pale face pressed against the glass, a ritual is performed with a bloody human skull, in the catacombs of chapels our heroes encounter the mummified bodies of monks. And on every cover, there is a Gorey illustration capturing one specific moment of despair exactly as it is described on the page. So, in many ways it doesn’t matter that Gorey and Bellairs may never have met, or that Gorey saw his illustrations for the books as nothing but a means to an end. Sometimes, for whatever reason, some things in life just fit. And something you see as inconsequential, a job, a relationship, a tossed off song or illustration, can wind up defining your legacy. Some things in life are just true. Matt Domino is the Associate Director of Editorial Operations and Growth at Artsy. He is also a fiction writer living in Brooklyn and has written about a lot of things -- most of which you can find on his blog, Puddles of Myself. Every language has a certain aural spirit to it, an auditory fingerprint related to those sounds which constitute the melody and rhythm of any tongue. YYAAAAASSSSSSSS! Finally. The ultimate artistic sandwich. More Gorey articles. I was under the impression that a documentary was being put together on him. If anyone knows the status of this, could they please let us know! Supposedly the Gorey docu is in post-production…. A credit point – The image of the frontispiece drawing from The Chessmen of Doom is a photo of the original art in the collection of Irwin Terry, and taken from his blog Goreyana.blogspot.com.